The White House and its partners in Upskill America—including the Lumina Foundation, the Aspen Institute, the Council for Adult and Experiential Learning, and the dozens of employers who are part of the Upskill America partnership—recently came together (on April 25, 2016, at the National Press Club’s Holeman Lounge) for a one-year celebration of the commitments and investments that employers have made in connection with Upskill America on the Win/Win: Making the Business Case for Employer Talent Investment initiative. The webcast of this event is archived here. This initiative was sparked by the release of the initial PIAAC data in 2013, which revealed that two-thirds of low-skilled adults in the United States were employed, indicating that employers were an important route to reach workers with more education and training. At the event, employers shared the results of their 2015 commitments and further efforts, and U.S. Secretary of Education John King, Jr., provided a recorded welcome. 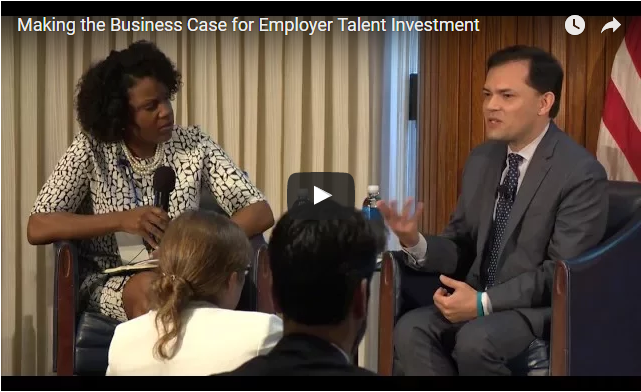 Employers from a wide variety of industries shared how their efforts to upskill their frontline workers were now an integral component of their talent development and employee retention strategies. Key data were presented on the business impact of upskilling entry-level workers and the return on investment of tuition assistance programs. The White House blog provides a summary that spotlights how employers nationwide have answered the President’s call to train frontline workers with the skills needed to earn higher paying jobs. In support of the event, the U.S. Department of Education’s Office of Career, Technical, and Adult Education (OCTAE) developed a fact sheet on the profile of lower skilled working-age (16- to 65-year-old) adults, with data from the PIAAC U.S. National Supplement 2012/2014. This fact sheet refreshes what we know about those who are in this population, their highest level of education attained, the industries in which they are employed, and how much they are earning, on average, for the work they do. To learn more about what employers and workforce development groups are doing to support upskilling, visit UpskillAmerica.org. 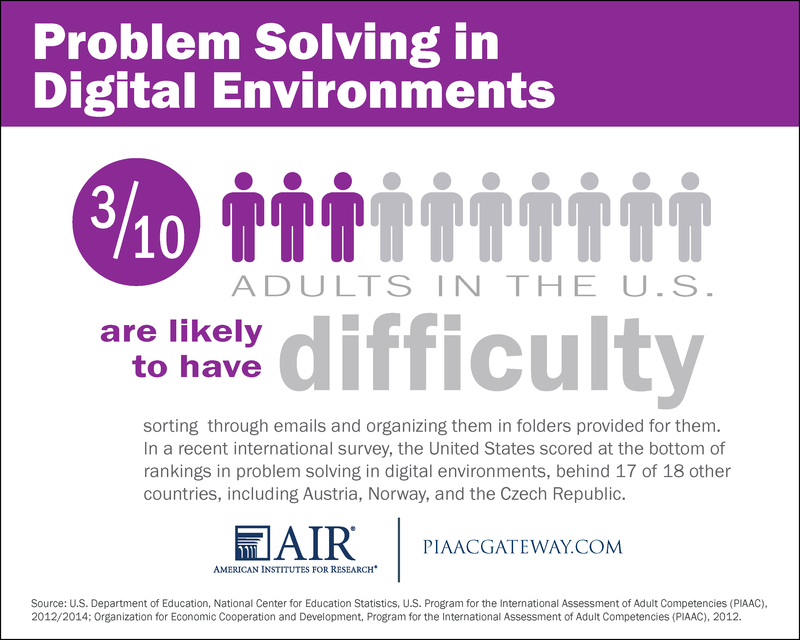 57% of U.S. young adults (ages 16-34) scored at or below the lowest of the three levels of proficiency — Level 1— on the PIAAC problem solving in technology-rich environments assessment. Read the First Look report to learn more. In 2013, the Educational Testing Service (ETS) launched “The Opportunity Project” with the goal of advancing a national conversation about the growing inequality of opportunity in America and what can be done to address it. The project has two phases. The first phase—“Describe the Dynamics”—analyzed how opportunity is transmitted and distributed and the complex dynamics that are involved. As part of this phase, earlier this year ETS published a book and a policy report that discuss opportunity in America. 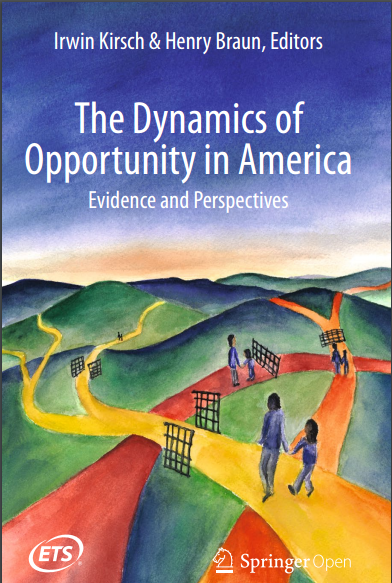 The book, The Dynamics of Opportunity in America, examines opportunity through several lenses, including education, economics, demography, and political science. The report, Choosing Our Future: A Story of Opportunity in America, uses PIAAC data in its exploration of the forces and circumstances that govern access to opportunity. ETS has now transitioned into the second phase—“Leverage Collective Experience”—which will bring together individuals and organizations working on effective interventions with the goal of leveraging their collective expertise in order to take action to reduce inequality in opportunity in America. To learn more and get involved, visit http://opportunityproject.ets.org/. In the last Buzz, we announced the release of the updated National Center for Education Statistics (NCES) PIAAC First Look report and the PIAAC Results Portal. Both now include the household data from the U.S. PIAAC National Supplement for the increased sample of unemployed adults (ages 16–65), young adults (ages 16–34), and older adults (ages 66–74). NCES has a strong commitment to continue to collect data about adult skills in America to inform policy on the state and national levels. In 2017, NCES will be collecting a third round of PIAAC data using the same procedures, instruments, and assessments as in the first and second rounds, conducted in 2012 and 2014, respectively. The data from the third round will be combined with the first- and second-rounds of data to provide small area estimates (e.g., counties or or congressional districts). Data from the 2017 data collection is planned to provide a second point in time of the nationally representative sample of U.S. adults that could be compared to the combined 2012/2014 estimate. The data will be collected between February and September of 2017; analysis and reporting will follow from October 2017 through April 2018; and the reports, updated data tools, and updated public-use and restricted-use data are scheduled to be available between fall 2018 and winter 2019. Stay tuned for more information. 109 XPrize teams are busy working on apps aimed at helping low-level learners develop literacy skills. The AIR-PIAAC team is working with XPrize to help provide PIAAC data that would be useful to teams as they develop their apps. The National Council for Adult Learning (NCAL) aims to improve adult education and workforce skills in the United States by fostering an environment that is more sensitive to employer workforce needs and helping to move low-skilled adults and incumbent workers toward readiness for college, self-sustaining employment, and fuller civic participation. Visit the NCAL website and check out NCAL’s latest newsletter. To receive the newsletter, send your name, affiliation, and e-mail address to info@ncalamerica.org. Over 100 people attended a series of sessions related to PIAAC at the Commission on Adult Basic Education Conference (COABE) in Dallas, Texas, in April. For a list of PIAAC sessions and PowerPoint slides, visit the Gateway Calendar Archive and for conference materials, check out the Adult Educator Resource database. Speaking of COABE, check out its new series of fact sheets on the return on investing in adult basic skills. The Organization for Economic Cooperation and Development (OECD), in collaboration with the Spanish Ministry of Education, Culture and Science and the Government of the Community of Madrid, has announced a call for papers to be presented at the 3rd PIAAC International Conference on November 6-8, 2016, in Madrid, Spain. Papers should promote the use of PIAAC data to help address relevant policy issues on topics such as the economy, education, employment, and social policy. Abstracts of proposed papers (2 pages maximum) are due by June 30. See the OECD website for more information. In 2014, nine countries (Chile, Greece, Indonesia, Israel, Lithuania, New Zealand, Singapore, Slovenia, and Turkey) participated in PIAAC for the first time. The OECD is planning to release data from this round at the end of June. Also see the brochure What does low proficiency in literacy really mean? (also available in French) in the “Adult Skills in Focus” series and Andreas Schleicher’s blog, Making literacy everybody’s business. This PLOS Collection will use the PIAAC data to explore the relationship between education and skills and public health for adults and their families, particularly those who are most at risk of poor educational, economic, and health outcomes. The Collection welcomes articles utilizing the OECD data and research that combines it with other extant datasets. The Collection was seeded by the U.S. National Institutes of Health and Department of Education with the explicit intent to serve as a repository for evidence-based research on this topic. All papers should be submitted to PLOS ONE. For more information about the process of submitting papers, visit the website here. 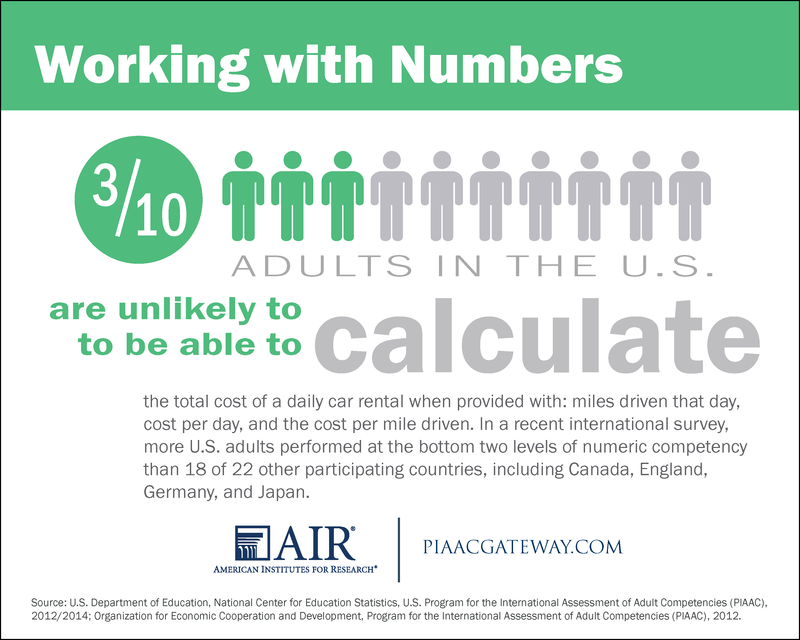 AIR has updated three “Facts from PIAAC” postcards and the “Skills to Pay the Bills” infographic with the PIAAC 2012/2014 data. Download, print, and share infographics here. 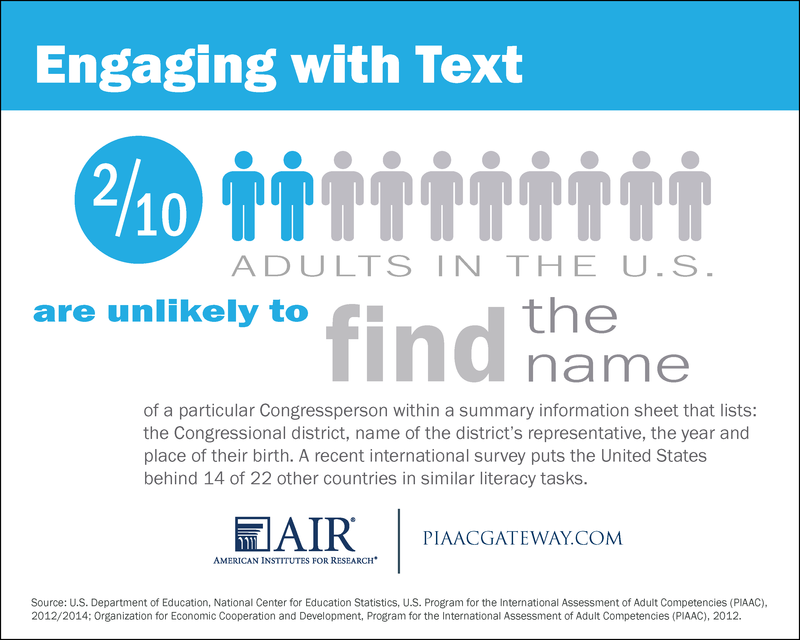 Stay tuned for additional infographic updates with the PIAAC 2012/2014 data! In the Outreach Toolkit, the “What Is PIAAC?” PowerPoint module has been updated with the 2012/2014 PIAAC information. A new brochure has been posted that provides an overview of PIAAC and its impact on policy and practice. What are some strategies for promoting PIAAC at the local and state levels? This is a question we have been asked by several readers of the Buzz.